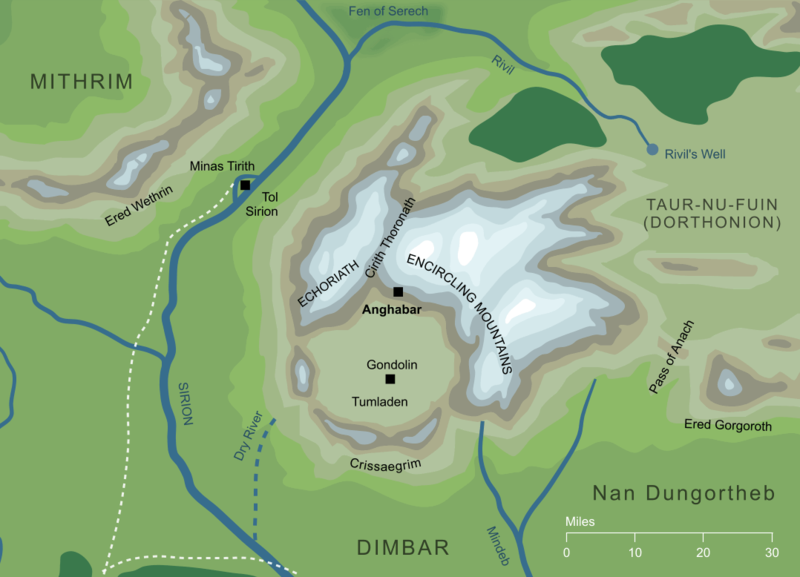 A mine in the Echoriath, or Encircling Mountains of Gondolin. It was Maeglin's questing for precious ores in the mountains that led him to discover a rich seam of hard iron in the northern part of the range. From the mine of Anghabar, that iron was extracted and used to increase and improve the arms of Gondolin, ready for the desperate and destructive battles in the closing years of First Age. We don't know precisely where Anghabar lay, except that it was in the northern parts of the Encircling Mountains that surrounded Gondolin. We can be sure that it lay on the inner slopes of the mountains, because Maeglin, who worked the ore from the mine, later did indeed pass across the mountains and this is treated as a highly significant event. However, beyond this simple description, the exact location of the mine is not established. Original content © copyright Mark Fisher 2005, 2019. All rights reserved. For conditions of reuse, see the Site FAQ.